Runs on 240 V input power and clean cuts 5/8" steel. Allows you to cut expanded/perforated metals, as well as painted or coated surfaces, without retriggering the torch. Prevents abrasive dust and particles from damaging internal components. Draws up to 30% less amperage for the same cutting range as compared to the competition. PFC expands operators work area via extension cord, while minimizing nuisance circuit breaker trips caused by voltage drops. Provides peak performance power under variable input voltage conditions (±15%) for steady and cleaner-ending cuts. Controls amount of usage and flow of air or gas. Protects unit by not interfering with or damaging controls or computers. LED lights for quick troubleshooting of pressure, power and cup situations. Secures torch, work cable and power cord to make transporting easy and convenient. Replacement torch for Hobart Airforce 40i plasma cutter with 12' leads. This plasma accessory kit is designed specifically for Hobart XT30R or XT40R plasma torches and is compatible for use with the Hobart Airforce 27i and 40i Plasma Cutters. Tips are designed specifically for use with Hobart XT40R Torch of Airforce 40i Plasma Cutter. Includes 2 tips. This drag shield is designed specifically for use with Hobart XT40R Torch of Airforce 40i Plasma Cutter. Includes 1 drag shield. 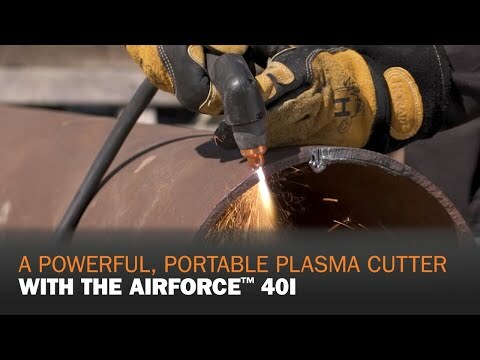 Get precise cuts with Auto-Refire™ Technology in the AirForce™ 40i Plasma Cutter.